I just adore demitasse cup and saucer sets. 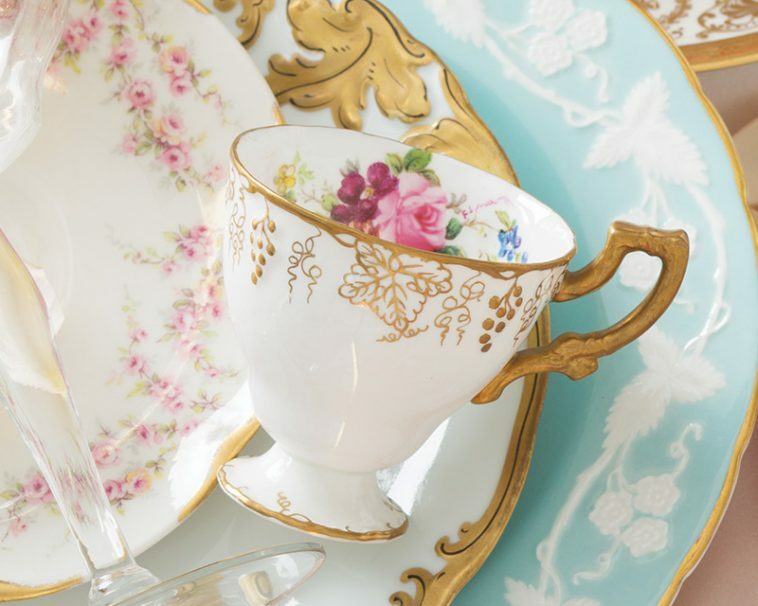 Their petite size brings back memories of tea parties as a child. The other day I was asked about these cups and the etiquette around them. Many know these cups as an espresso cup, which is also correct. Espresso and demitasse are very similar as both are brewed with a finely ground dark roast. A traditional espresso is made with an Italian roast, while a demitasse is made with a French roast. Actually, the word demitasse is French and when translated to English it means “half cup”. This is because the demitasse cup is quite literally half the size of a regular coffee cup, making it the perfect drink to serve after dinner. The demitasse cup is not included in the place setting of a meal. Instead, it’s reserved for after dinner. You can serve it with dessert or you can wait to serve it after dessert. After leaving the dining room table you can lead your dinner guests to a seating area to enjoy a cup of coffee and continued conversation, think Downton Abbey! Many people think a cup of coffee after dinner will cause them to lose a night’s sleep. Although true for some, you can rest easy knowing that a cup of demitasse coffee may be stronger in flavor, but it has less caffeine than our everyday breakfast coffee. I have seen people brew delicious cups with an espresso maker or pressure pot. A pressure pot allows you to brew enough coffee for multiple cups and it’ll travel easily from room to room. You should serve it with sugar and cream, or if you prefer, serve it alongside boiled milk. Combined in a larger coffee cup, the demitasse and boiled milk create a Café au Lait. However you choose to use your demitasse set, I hope you enjoy every sip! Do you have a demitasse set? lovely post again! We drink our morning coffee out of demitasse cups which I bought about 30 years ago. They are plain and utilitarian, but I enjoy drinking delicious Frenchpress coffee from a cup and not a mug! I often use my demitasse cups and saucers for serving a wonderful yellow squash soup that I serve cold. It is delicate and is perfect with the small cups. Ah yes, china tea cups and saucers , of all sizes, and yes demitasse, for sure all have solace in my heart, in my china cabinet, and on a special shelf just made for showing some of them off. I like nothing better than using them and serving tea, but have seldom used any for coffee. Perhaps that should change. I still dream of actuallybputting on tea parties for children and teaching manners- what this world sorely needs at the present time. 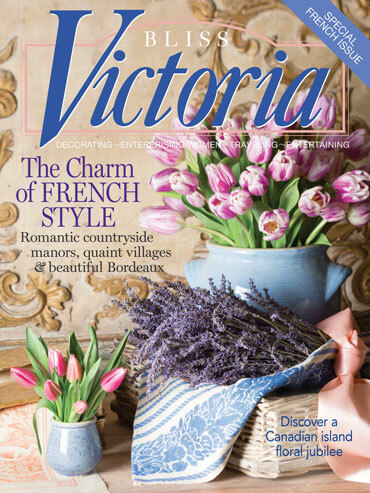 Thank you Phyllis, as always for ” Ribbon In My Journal” and Victoria Magazine. Obviously all of we ladies love it! Actually now that my husband is semi retired, he is reading it and notices all of the beautiful places and of course the antiques presented! I enjoyed your article on the demitasse sup. I find at estate sales etc. the cups without saucers and have put miniature violets in them and use them as party favors for tea parties-antique club meetings and they have a gift to take home. They are such little treasures and I am soooooop happy you are encouraging us to resurrect them and start using them. Good for you. Thank you for this entertaining and enlightening post. The evocation of pleasant memories made my day. What a lovely photograph of a demitasse and other china. You always awaken such beautiful thoughts. That picture made me remember giving tea parties for several of my grandchildren together when they were all the right age. The one grandson in the group used his tea party manners as required. The granddaughters decided to assume elegant names and became Lady Lillian and such, while I remained Mrs. Bancroft. Each child chose from my collection of demitasse. When my great-grandson asked, ” And how are you today, Mrs. Bancroft?” I told him that I was delighted because so many of my grandchildren were with me. “And pray who might they be?” the five year old responded. I miss those precious tea party days as my seven grandchildren are now scattered far and wide across the U. S. A., married and with little tea partiers of their own. Thank you once again, Phyllis, for stirring up favorite memories of bright, shining moments. I was just looking at a few demitasse sets about thirty minutes ago at an antique shop. Some were just so pretty! I have a few pieces as I want a collection of different styles. Enjoyed this post. I too, thank you for the demitasse enlightenment! I have a lovely old set and two additional stand alone cups that have been on the top shelf of my kitchen cupboard. They are now down, freshly cleaned and in a place of honor ready to be used at my next dinner party! Love the story of the two types of cups… and as always this blog!!! I have my mother’s set. I remember my dad and I searching for 12 different cups. She used them for serving coffee and dessert to her bridge group. One of my cherished memories of her. I have a demitasse set I inherited from my grandmother. I remember eyeing it as a child. It was one of the antiques in my grandmother’s collection so I was never allowed to touch it. Because it is old and one of the few keepsakes I received, I display it in a china cabinet and love looking at the set. Love hearing others have the same appreciation I have. On our honeymoon in the Bahamas, we enjoyed after dinner expresso at a sidewalk cafe. As a result of one of our first dining experiences as newlyweds, enjoying espresso together has become a treasured tradition. One of the first nonessentials we purchased was a copper stovetop expresso pot and cups. Funny, I always think of the more chunky ceramic cups like I just used as expresso cups and refer to the more delicate porcelain or bone china cups as demitasse. We have small collection of expresso cups and several demitasse sets. After reading your essay, I just prepared and served my husband a cup of expresso. He was pleasantly surprised with the out of the blue gesture. Thank you for the impetus this morning to create a pleasant interlude amidst the everyday!! Oh how I enjoy reading your posts! This entry made me recall the espresso set that my parents used! Brought back such sweet memories, especially since they have both been gone for decades. Good luck in your new home. I have a question, have you ever thought of writing your auto biography? I would love to learn how you became such a successful editor! All your magazines bring me such joy. Thank you for creating this blog and for all that you share. Really enlivens my day! I too inherited a Demi-tasse set from my mother,along with so many other tea cups. I am embarrassed to admit,that I didn’t really know what they were supposed to be used for,as I always drank espresso from a tiny coffee cup. My demitasse-tasse cups have pretty pink magnolia’s on a white background rimmed with gold. I have kept them on a shelf too long and am excited about using them now…thank you Phyllis, for enlightening me. This is why I love your magazines and this ribbon!! I always learn something new. I didn’t grow up with these fine things and didn’t inherit any thing of this nature but at an early age began to see and read about tea services, and demitasse cups . Victoria was the beginning of my love for such things and I was devastated when it was no longer published. I was so glad when you started publishing Victoria again and I look forward to receiving it every month. It is an educational tool I use and today I have all of these thing and enjoy using them frequently to bring a little bit of elegance into my daily life. I have a ‘set’ from my grandmother. She collected one of each pattern she liked, from France, England, Ireland and the States. All so beautiful and delicate. My father brought back gold plated demitasse spoons from Brazil that have a coffee bean on the end of the handle. A unique collection that always starts conversations at the table! I love these petite little treasures. They are also the #1 antique porcelain piece my client’s put on their wish list with us should their husbands or children contact us and ask what to buy for them for a special occasion! The antique ones I have tend to sell almost immediately. They do bring back my childhood too, as my grandmother allowed me to use her best demitasse sets for pretend tea with her. They really are like miniature works of art! So delicate and refined. My mother in law , bought me the whole set of Royal Winton Welbeck 1995, when Victoria Magazine offered it. She also ordered the small teapot later on after my daughter was born in the Spring of 2000. I have used that set every year for her birthday party this year was no exception. It’s such a beautiful set she also gave me a beautiful tea set from Ireland, that I will one day give to my daughter. Phyllis, I love demitasse cups, also. As a child they were the perfect “doll” size. In my sorority in college, demitasse was served in the living room on special occasions. I am sure they are much more casual now. I enjoy using my demitasse cups for pot de creme. They are just the right size for this rich dessert and the look is elegant. I have a set I used as a child for tea parties with my friends. My mom had a matching full sized set which I also now have. Maybe someday I will be lucky enough to have a granddaughter to use them with! Thank you, Phyllis, for the story on the Demitasse cup. I have some of them, but have never used them before. This has inspired me to get them out and use them. It will be fun! Beautiful – I love espresso and café-au-lait. The petite sets are so elegant. Thank you Phyllis.